Nitro-poached green tea and lime mousse "lime grove"
See Eat Me Daily's review of this cookbook. 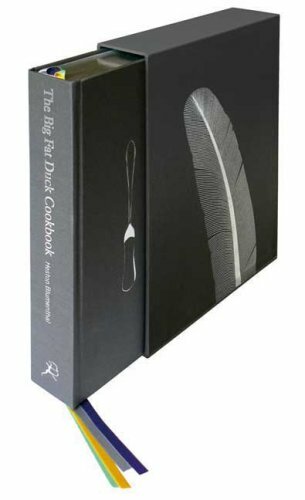 The authoritative must-have from the culinary genius behind the Fat Duck, the restaurant named best in the world by Restaurant magazine. This lavishly illustrated, stunningly designed, and gorgeously photographed masterpiece takes you inside the head of maverick restaurateur Heston Blumenthal. Separated into three sections (History, Recipes, Science), Blumenthal chronicles his improbable background and unorthodox rise to fame and, for the first time ever, offers a mouthwatering and eyewidening selection of recipes from his award-winning restaurant. He also explains the science behind his culinary masterpieces, and the technology and implements that make his alchemic dishes come to life. A luxe showstopping document designed by acclaimed artist David McKean--and filled with photographs by Dominick Davies--this artfully rendered celebration of one the world's most innovative and renowned chefs is a foodie's dream. Heston Blumenthal's Fat Duck Cookbook from Howard Silver on Vimeo.